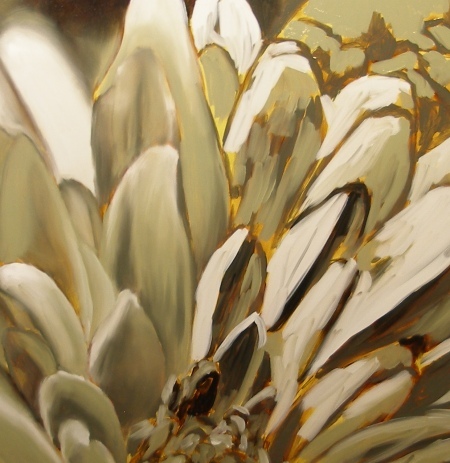 Flower oil painting demonstration of the golden Chrysanthemum. 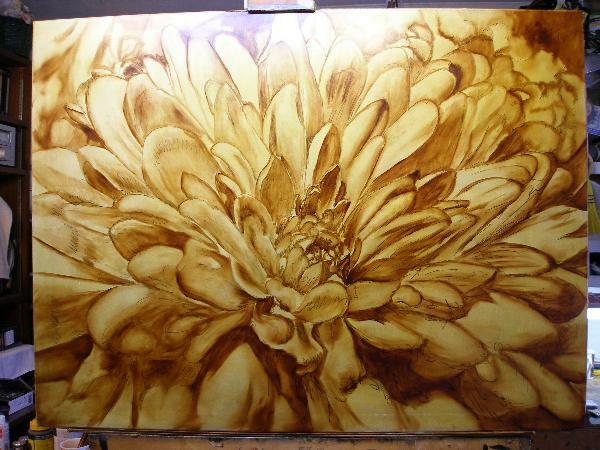 Flower oil painting demonstration of the Chrysanthemum. This is a super demonstration as it will show you this very complex flower that when broken down to small pieces, you can achieve a very wonderful piece of work. So many petals, and so little time to paint them all! Stick with me here, and I'll show you how to get through this without losing your cool! To start, take your time. 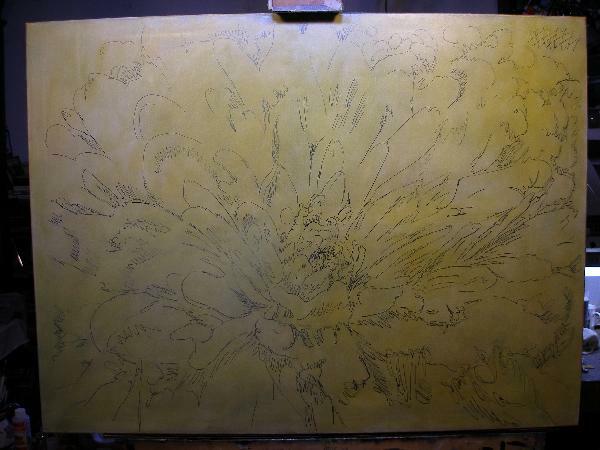 In this picture, we see the toned canvas with the ink drawing completed. The more time you take even in this early stage of the painting will help you reap the rewards of a successful piece in the end. 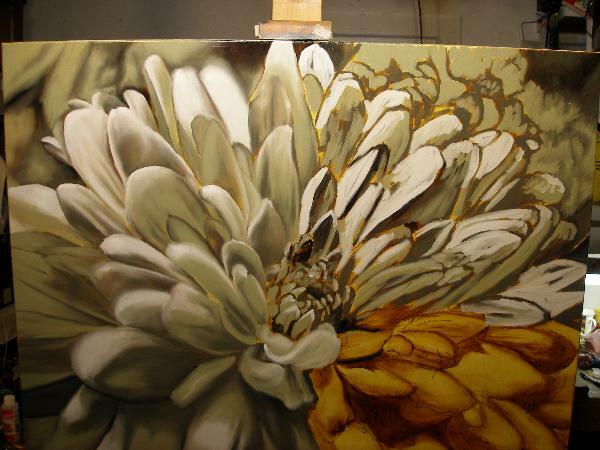 This is a large canvas, but even on a smaller canvas, drawing each petal is important. You just can't depend on something happening in the future when you don't have the underlying structure completed. So take your time with the drawing. In the classical schools, you would draw this free hand. I find it simply too difficult to get the scaling correct. On smaller works, sure, I draw them free handed, but the larger pieces, it's just too easy to get something incorrect in the proportions. If you do just a little research, you'll see that most large format painters utilize a grid method in transferring their drawing to the canvas. In the next photo, you find the brown under layer painting. The umber-under-layer as it is called in some circles. I've taken a great deal of time here too. Each petal is meticulously put together. Applying the burnt umber and blending towards the light side of each petal. It's ok to also wipe away paint with a lint free rag to achieve what you wish. After blending, we need to go over the entire painting with the mop brush to soften and set all edges. If you use a dryer to accelerate the drying, be careful as the painting may already be tacky. The e-book describes this process thoroughly in its depiction of vases and grapes. The same techniques would be used here within this flower oil painting. Now below, we have the dead layer, or gray layer in process. The left side of the painting is completed, and the right side, you see where I've laid in the gray mixtures but not blended them yet. On large paintings, I can get by with using less gray mixtures. Only 4, maybe 5 mixtures are needed. I do a great deal of the blending right on the canvas. Lets look at a closeup view where you can see on the left a fully blended portion, and on the right, grays that are blocked in only. You can also see a great deal of the underlying brown layer showing through too. This helps in the color layers in keeping these petals warm. At this point we let the painting dry for several days. I do use a dryer to speed up my process. With out it, the painting would take weeks to dry before we could move into the color layers. Click the link to go the color layers for this flower oil painting demonstration.